Celebrate contrast. Discover harmony. VinYin yoga Brisbane and Toowoomba – it’s the best of both worlds. Looking for a holistic yoga class that promotes balance and harmony? Look no further. VinYin is one of our favourite classes, as it combines the best of flowing vinyasa with the mind-settling benefits of yin. VinYin classes are truly greater than the sum of their parts. Give it a try yourself – check out our Brisbane yoga timetable or Toowoomba yoga timetable to find a class time that suits you. 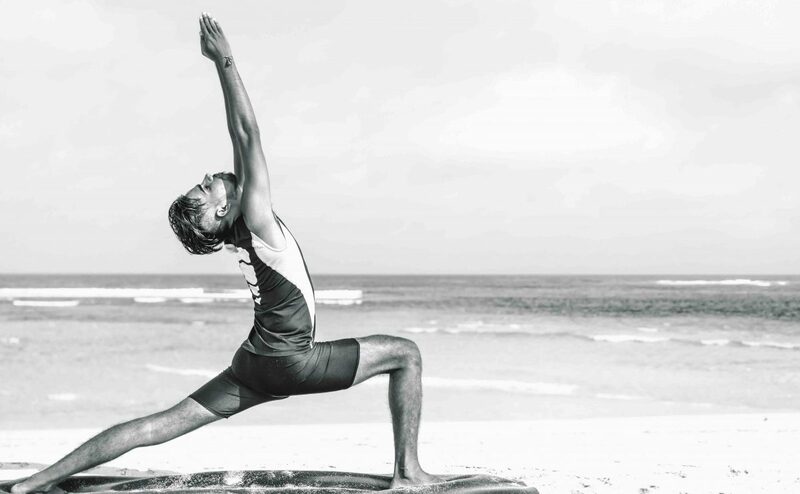 Zama’s VinYin yoga classes are a perfect combination of vinyasa and yin yoga styles. The class begins with 30 minutes of vinyasa, and finishes with 30 minutes of deeply relaxing yin. Here’s a little more information on vinyasa and yin yoga. Vinyasa yoga is a style of yoga practice that flows from one posture to the next using the breath as a cue. If you’ve ever practiced sun salutations, you have practiced vinyasa yoga before. Although vinyasa is characterised by flowing movements, expect to hold some poses for up to five breaths. This helps us come deeply and presently into the posture, and reap all the incredible benefits it has to offer. Zama’s vinyasa yoga is suitable for yogis at any stage, whether you’re just starting out or have been practicing for over a decade. It’s a fairly high-energy practice, so get ready to break a sweat and feel those muscles burning. Yin yoga is almost the complete opposite of vinyasa yoga. Instead of flowing with the breath through a sequence of postures, we hold each floor-based pose for between 3 and 5 minutes. The goal of yin yoga is to increase flexibility, range of movement, and suppleness, while quietening the mind and coming into a state of relaxation. To do this, we target the connective tissue – such as the ligaments and fascia – in the body. These are much stiffer than our muscles, and take about 3 minutes to fully release. If you’ve never given yin a go, our VinYin classes are a fantastic place to start. Holding uncomfortable postures for up to five minutes can be very difficult for beginners. Starting with 30 minutes of yin is a great way to ease into this unique practice. All yoga is good yoga, but what makes VinYin so special? Here are a couple of benefits that the nourishing practice of VinYin offers. Inhale. Exhale. Reach. Release. Expand. Surrender. If you find yourself getting easily distracted in a traditional yoga class, VinYin could be for you. The class begins with a more active practice, as we raise our heartrates and get our muscles working. Just half an hour later, we transition into a deeply satisfying, still yin practice. This dynamic way of practicing is not only beneficial to the body and mind, but is also a whole lotta fun! Earn your yin practice! Vinyasa is a yang style of yoga that will definitely get your heart racing and your muscles working. As you flow from one posture to the next, you’ll be strengthening the whole body – especially the core. You will be strengthening and lengthening through your vinyasa practice, plus opening and relieving tension through your yin practice. Both of these contrasting styles improve flexibility and encourage a greater range of movement. Over time, you might experience less aches and pains. First, we’ll wake up the body, and bring some movement and vibrancy into your muscles. Vinyasa is a great way to relieve the body’s tension after a day at work. Then, we’ll cool down the body, and, importantly, soothe the mind. After work, you might find yourself running through tomorrow’s to-do list, or reliving an awkward conversation. Yin is a time to get out of your mind and into your breath and body. As we mentioned above, yin is a much-needed opportunity to bring a sense of calmness and quietness to the mind. What’s more, our vinyasa practice will have you focusing on the teacher’s instructions, not on your dinner plans! As you tune into the breath, each sequence becomes a sort of moving meditation. We are multi-dimensional creatures that require a balance of yin and yang practices. We strive to find harmony between our active selves, and our quiet selves. Neither is superior, and both are necessary. Vinyin is a wonderful way to experience both ends of the spectrum, with a more active practice complimenting a deeper, more internal practice. It’s only natural to feel a little anxious about trying a new yoga class – especially if you’re a yoga newbie. Here’s what you can expect at our all-levels VinYin classes. Do keep in mind that our hand-picked teachers add their own personal touch. We love the diversity! Because the class is split into two distinct halves, most teachers like to get started with the vinyasa practice right away. Expect to start with gentler, simpler sequences. As you move through the sequence, additional postures and more advanced options may be added. Remember to listen to your body – avoid pushing or striving and celebrate surrender. The vinyasa portion of the class might end with a few balance posture or core-strengthening poses. Then, we’ll move into the yin portion of the class. Yin poses are practiced on the floor, and often include the use of props, such as bolsters, blocks, and straps. Finally, sweet, sweet Savasana i.e. complete and total relaxation. Discover a class time that suits you. Check out our Toowong timetable or our Toowoomba timetable. Feel free to give the studio a call if you have any questions. Our studios can be reached on 07 3162 1652. We hope to see you in the studio soon.